GIFTS FOR MEN: THE BEST STAR WARS GIFTS | muted. This Gifts For Men buying guide has the best Star Wars gifts available. In our humble opinion of course. Each of these gifts is meant to bring the excitement of the Star Wars Universe home with you whether you’re on the side of the Rebels or the side of the Empire. Check out this video then you will know this mask is the perfect gift for any Star Wars fan. 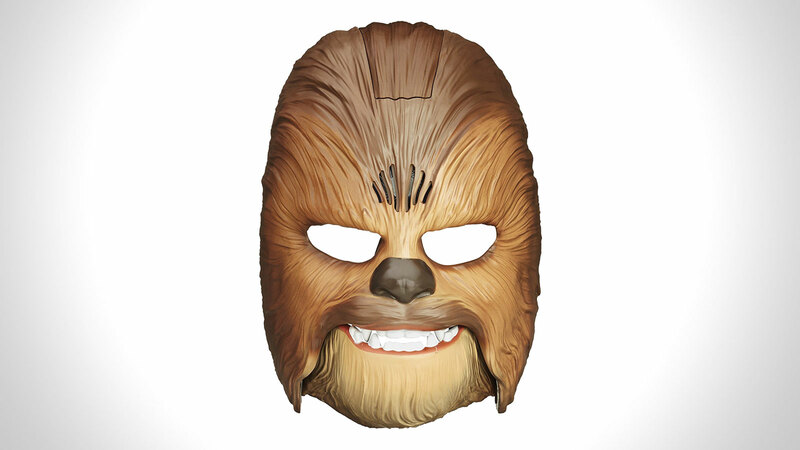 The Star Wars The Force Awakens Chewbacca Electronic Mask ($18) will bring you endless hours of laughs. It features a movie-like appearance. To wear it, just slip it over your head and adjust the straps for a perfect fit. Open your mouth a little for a low roar, or open it wider for a louder roar. The mask comes with instructions. You can buy now on Amazon. The Sphero Star Wars BB-8 App Controlled Robot ($128) originally started out as a design by concept artist Martin Hajek. He pondered what a robot would look like of Apple built one. But Sphero beat them to the punch and released their very own version. 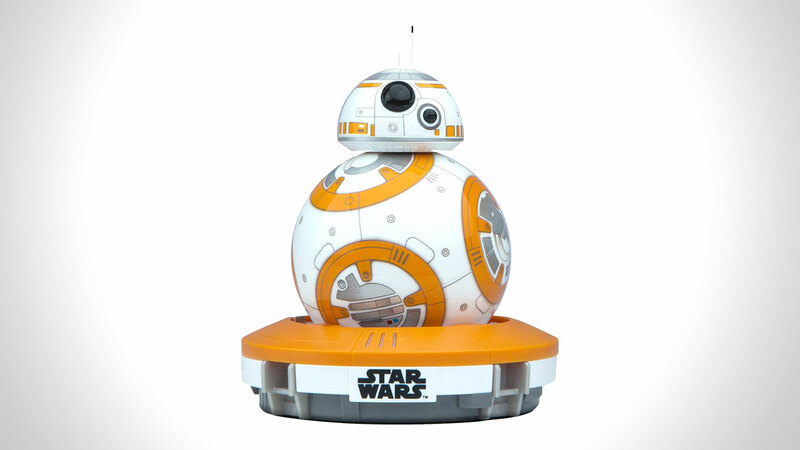 The Sphero BB-8 Robot is an app-enabled droid powered by a gyroscopic propulsion system and has a 30m range. It comes with an induction charging station and has 60 minutes of battery life. The free iOS & Android app provide an adaptive personality for your robot and also let you view holographic recordings. One of our favorite Star Wars gifts. 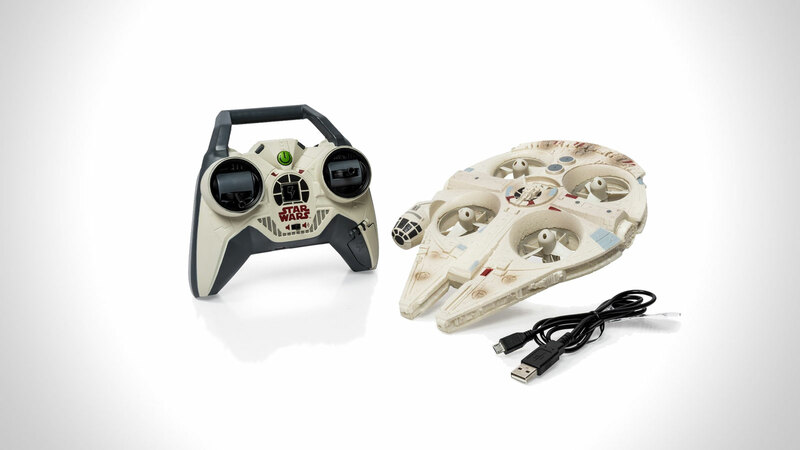 Drones are in, and what’s better than a Star Wars Remote Control Millennium Falcon Quad ($89). You can now fly the most iconic ship in the Star Wars universe indoors and outdoors. This quad features 4 rotors concealed within the body of the ship for safety, LED lights, and authentic sounds. It’s controlled by a 2.4GHZ controller and can fly up to 200 feet away from your location. It also has a hyperdrive stunt with a push of a button. Pretty cool. Not only did Air Hogs come out with a Millennium Falcon Quad, but for those who require a little more action they created the Star Wars X-wing vs. 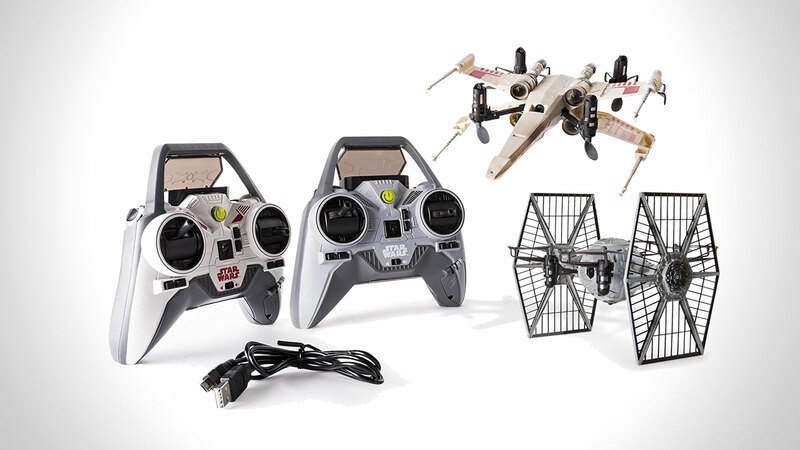 TIE Fighter Drone Battle Set ($182). Your choice, you can either be the good guys and fly a Tie Fighter or a bad guy and fly the X-wing drone. Try and shoot down your opponent with bursts of infrared. Take aim and be the first to land 3 direct hits to win. The battle is tracked on your remotes heads-up display and accentuated with responsive lights and sounds. The set comes with two 2.4GHz controllers with a 200ft range and two drones. 12 AA batteries are not included. The Uber Star Wars fan will require a little more authenticity in his gift. 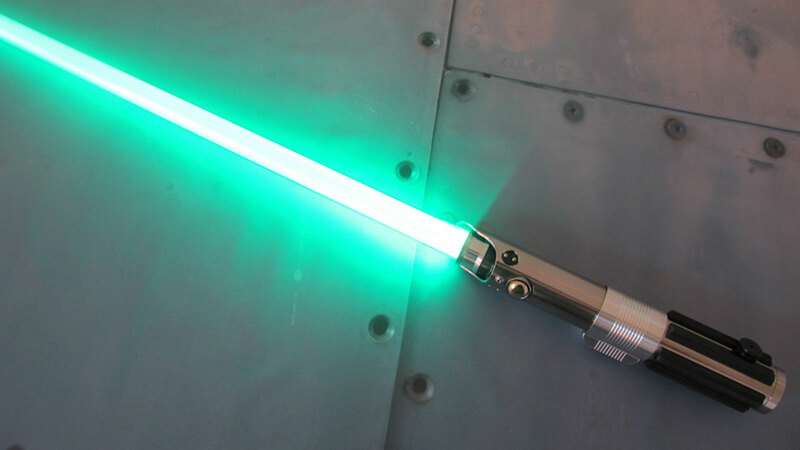 How about something like the realistic Ultra Saber Graflex CE ($224). All of Ultra Saber’s lightsabers are made from custom CNC machined billet aluminum components, giving them unparalleled strength. When ordering the Graflex you get your choice of blade colors including Blazing Red, Consular Green, Guardian Blue, Fire Orange, and Adegan Silver. Each of these blades is made with single diode High Powered LEDs to bring them to life. Of course, every lightsaber comes with authentic sounds. 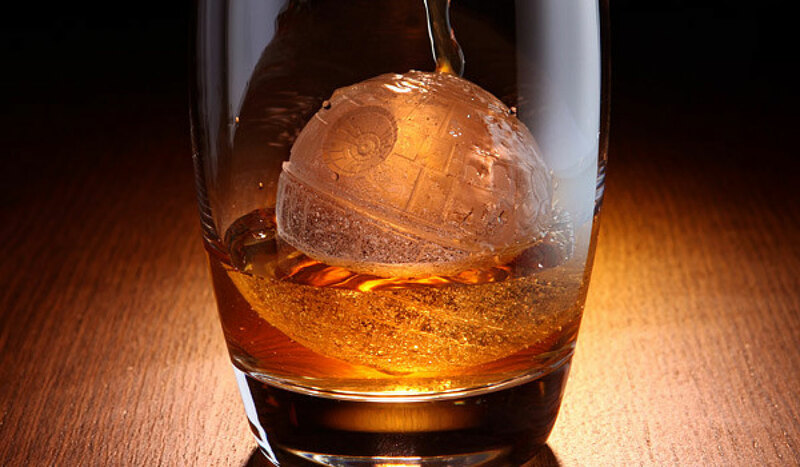 Straight from Bessmate, the Star Wars Death Star Sphere Ice Ball Maker ($10) makes a ball of ice in the shape of the death star. It’s made from 100% food grade silicone and is BPA-free. The silicone it uses can withstand heat to 446-degrees, so if the fancy takes you, you can also make some cupcakes in the shape of a death star. Each pack comes with two molds.